Conveniently located in downtown Milwaukee, these contemporary offices to lease provide car parking, cutting edge technology and spacious meeting areas. Clients benefit from superb access to the surrounding amenities. Restaurants, shopping and all of the greater Milwaukee area are just minutes’ away. This center located in Milwaukee River in this historic building. The central location makes for an easy access to the transits around the city. Enjoy the downtown environment and explore the entertainment options. 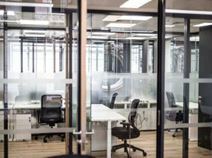 Take a look at the coworking and private offices there are to offer for your teams business needs. Stop in today and visit the on-site management team to see what options are best for you. This center is due to open soon and has a prominent corner position in Milwaukees most creative space. It is surrounded by industry, technology, and service-based businesses while I-794 provides good road links. This prominent historic location and exceptionally well connected business hub is part of a main entertainment district and the area is a key location for much political activity in the city. This center's provided furnished office suites are complemented by free executive conference room use and a whole host of exceptional and contemporary business facilities and professional services available freely for all occupying tenants. This center offers a range of office spaces, along with a full complement of business support services. Set in attractive landscaped grounds, the building boasts impressive interiors, and is strategically placed just off highway 45. This exquisitely furnished and contemporary business center installation is a state of the art and stylish working environment, complete with an extensive array of professional equipment and business facilities available on-site as standard for all prospective occupying tenants. The center is easily accessible via numerous convenient local transport links and is the ideal venue for both corporate events as well as office requirements. Presenting Glendale’s most eminent business centre located in the trendy Gold Coast area. All executive suites come fully equipped to meet modern business demands, including cutting edge internet access and advanced telecoms equipment. The location is fantastic, only moments from I-43 and downtown Milwaukee.